This Will Only Take 5 Mins Of Your Time! Just to save your time, this article is for anyone that wants to know how this wedding set up in the image above cost less than $2,500. We’ll begin by breaking down how to save on planning a tent wedding. At the end, we will breakdown the order from the image above and show you exactly how to get that for less than $2,500. So stay tuned and enjoy! Also, we’ll be including 3 money saving tips throughout the article. Before we begin, I would like to mention something. Things often aren’t the way they use to be. Back in the day, couples had a lot of help from others chipping in to pay for the wedding. It’s becoming more common for couples to pay majority of their wedding. Which can be challenging for many couples. You’ll be faced to make decisions that solely rely on your budget. And my advice is to never sacrifice on something you want. Instead, find a greater alternative. If your heart is truly set on a vendor or something you want for your wedding but you can’t afford it. I promise you, there is something out there equal or better that could substitute what you’re essentially “replacing”. So stay hopeful and let’s dive into this article. The very first number you’ll want to know, is how many people are you expecting to attend your wedding. That will determine the size tent you need and how many tables and chairs you’ll need. It pretty much controls all the cost. The other part of controlling cost is just choosing the style of rentals you’d like. MONEY SAVING TIP #1: Seat guests at rectangle tables versus round tables. 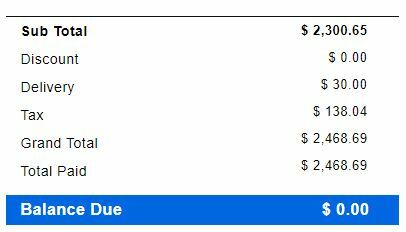 The cost for either table is the same. However, rounds take up more space. This means you’ll need a larger tent to accommodate the larger space required for round tables. Let me show you in the examples below. Both tents are the exact same size. But the round tables have 20 tables (8 people per table) which holds 160 people. Meanwhile, the rectangle tables have 30 tables under the tent (8 people per table) which would hold 240 people. 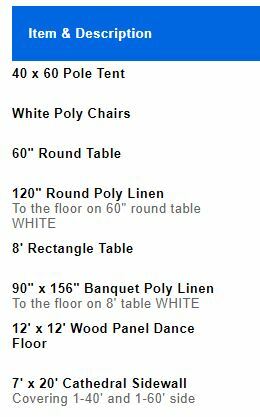 So, providing you don’t “need” round tables and want rectangle then you can save a good chunk of change on your wedding. The two styles you’ll be choosing from are a pole tent or frame tent. you’ll probably need help deciding and when people ask which style do we recommend, the answer is “if it was my wedding, I would 100% choose the frame tent”. The benefits are endless. However, the frame tent is a little more expensive. There is absolutely nothing wrong with a pole tent. In fact, pole tents are way more popular and often rented out the fastest because people prefer the pole tent. The frame would be considered an upgrade. Below is a picture of each tent so you can visualize the differences based on looks. This is the fun part because you get to make your event very unique. We over a variety of add-on items that can really make your wedding pop. But the truth is, half the stuff we provide can be done via DIY. It’s like picking out of a wedding catalog. You can say “like that” and “nope not that” to how you’d like your tent look. Your tent is going to be a white canvas and you are holding the paintbrush. You get to make it as beautiful as you’d like. You can find a lot of great used decor inside the Facebook group “Maryland Wedding Consignment”. And we highly recommend using an event planner if you’re deeply stuck with envisioning your wedding. Outside of those two recommendations, you can find a TON of decor items on Oriental Trading. This goes for invitations, table decor, lighting, backdrops and so much more. Oriental Trading has it all. The image here shows you everything that this client ordered. This wedding was for 100 people. She chose a pole tent and she even used round tables which is what many brides prefer. 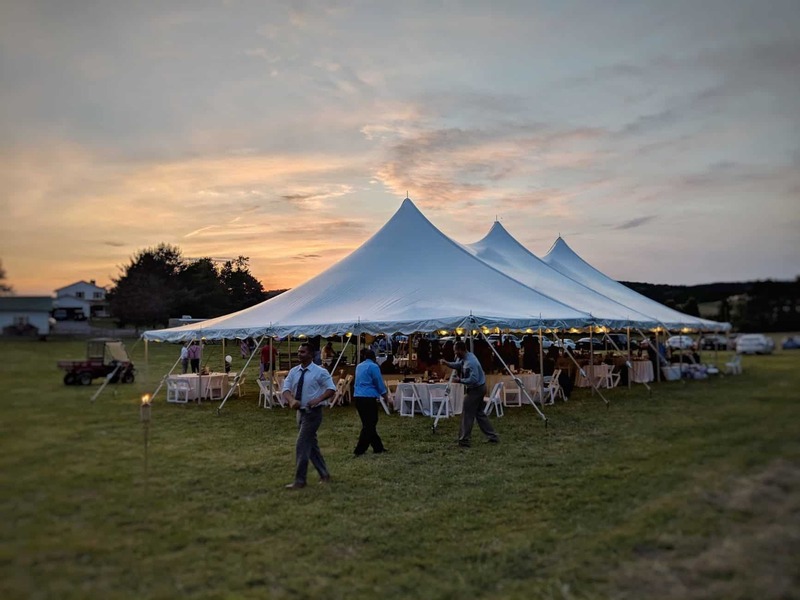 When you rent an outdoor tent wedding, you open yourself to full customization. 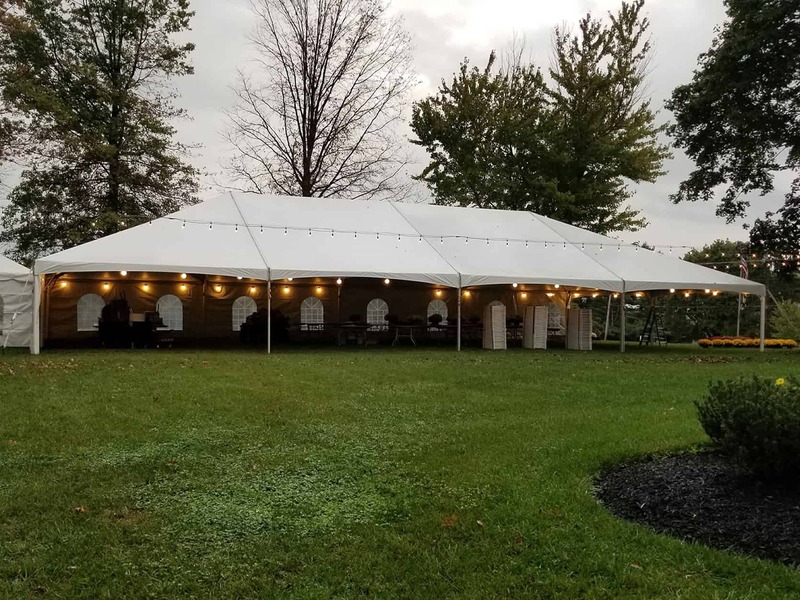 This wedding included sidewalls to protect from rain. It included linens to cover all of the tables. And enough seating for 100 people. Oh… AND IT INCLUDES A DANCE FLOOR FOR YOUR GUESTS TO PARTY ALL NIGHT LONG. Ready To See The Price? This is a screenshot right from this client’s order. She got all of that listed above for $2,468.69. Not to mention, this order didn’t include any discounts. If you book early enough in advance (and providing we’re able to) we do occasionally run promotions throughout the year. Want to hear how easy it is to plan? How Easy Is It To Plan? The main struggle brides have with tent weddings is “where can I put the tent”. If you have a property that allows it, this is definitely something to consider. 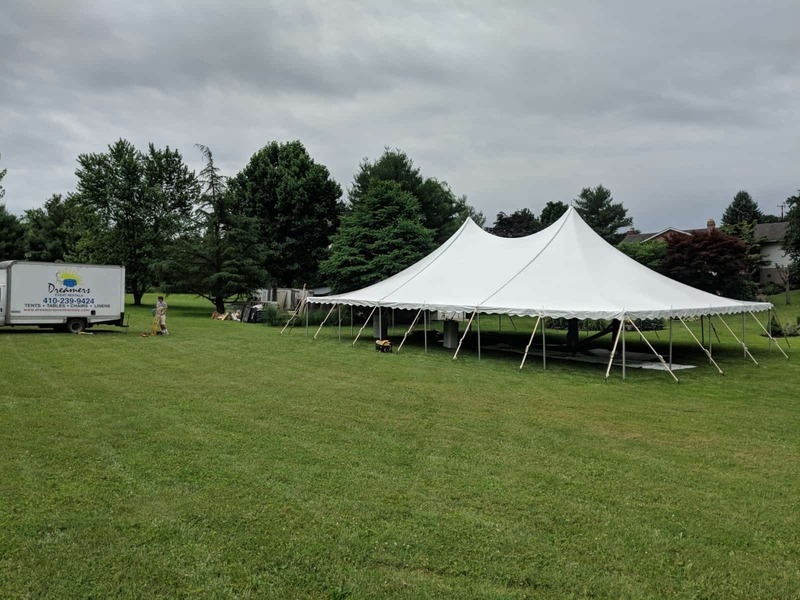 However, even if you don’t have a property to place our tent, we work with many incredible venues that allow us to install our tents on. They look gorgeous there too. So even if you don’t have the space, we can help you find that space you’ll need. Step 1) You’ll just need to decide on a place which we can help with. Step 2) You’ll want to get a rough estimate of the amount of guests you anticipate. Step 3) We’ll come out and inspect your property and make sure it’ll work out great. Step 4) We’ll put together a quote for you and we’ll include a 3D layout so you can envision your event in 3D upon request. Step 5) If everything looks great then you just reserve your order. Next, we’ll wait until we get closer to your big day and make any changes that need made. Step 6) Our team will deliver your event exactly how you like it and we’ll confirm everything is perfect. Step 7) You’ll have the best night of your life under our tent. Step 8) We’ll pick everything up after the weekend and you’ll be left with a memory worth a lifetime. With over 70+ 5 star reviews on Google, we really aren’t lying when we say we’re pretty good at what we do. And we want to work with you too. Tent weddings are so much fun and our goal is to show you exactly how fun it really can be. Thanks for reading through this article. We hope you found some value out of this and we’re here to help you in any way that we can. If you’re considering an outdoor tent wedding then we want to earn your business with this limited offer below. Our FREE "New bride survival guide"
Our "Tent wedding look book"
All you have to do is fill out the quick form below and we’ll help you every step of the way.